Laminating film evguard – DIF, s. r. o. The evguard® EVA lamination film is the result of long-term research and development and, in addition to its high transparency and reliable stability, it also ensures its low temperature processing. Because it is produced in Germany and European raw materials, we guarantee a constant quality level. Our history lies in the extrusion of plastic films in customized dimensions and according to individual formulations. The properties of the film can be adapted according to the specifics of the country. For example, providing higher UV protection in southern countries. Together with our dedicated research and development team we can work out the best individual solution. Evguard® is available as a transparent or milky-white EVA laminating film. For the lamination process, we have developed an optimized PET film (PET-MPE), which withstands high thermal loads. The film can be incorporated into the laminate as a colored or printed interlayer to ensure the desired design. Due to its improved impact resistance, the PET film also increases the stability of the laminated glass. The stability provided by evguard® as a laminating film has been extensively tested inhouse to ensure consistent quality, and this is backed by certification from third party institutes. 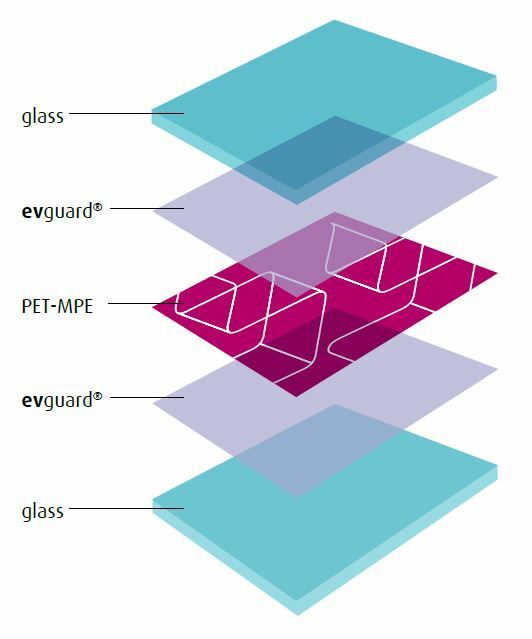 Unlike conventional PVB and EVA films, evguard® already complies with the standard of the pendulum test at a composite structure of 44.1 [two panes of 4 mm (0.16 ins) thick glass and one layer of evguard® film 0.380 mm (0.015 ins)]. This means a real material saving for the processor as one layer of evguard® is sufficient to obtain the same solid and reliable result. The evguard® laminated glass film is a durable material that, thanks to its reliability and static properties, opens up new possibilities, particularly for the construction sector. What‘s more, laminated glass with evguard® has a life period of several decades alongside optimal sound protecting properties. Using evguard® in the laminated glass structure 44.2 (two panes of 4 mm (0.16 ins) thick glass and one layer of film 0.760 mm (0.030 ins), an airborne sound reduction of at least 36 dB can be reached – without additional sound absorbing layers. Glass creates a sense of openness and transparency, and so is progressively becoming more and more important, for example, in corporate architecture. The transparent building material is increasingly integrated in the façade engineering, both as individual surface and as entire glass façade. 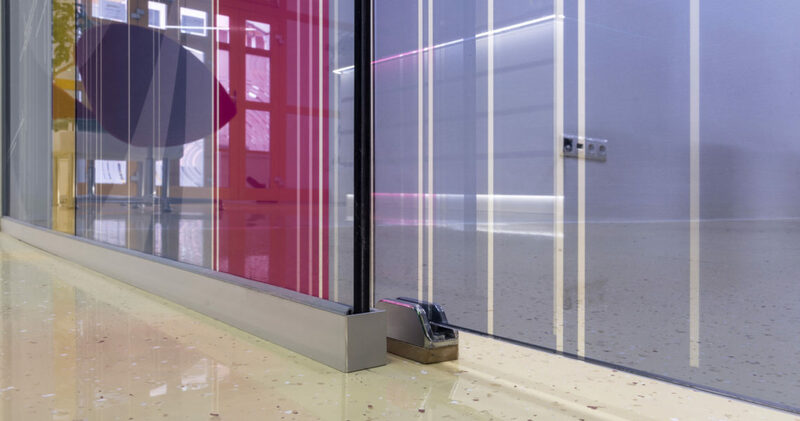 These applications put high demands on the laminated safety glass that traditional materials usually cannot meet. If evguard® is laminated in the composite, this EVA film cross-links. Later, this cross-linking prevents the film from losing its stiffness again and from softening when exposed to wind and heat. Façades, in particular frameless glass fronts, thus remain solid. Therefore evguard® provides an increased stability and an improved appearance of the element. This modulus of shear effect has already been tested in its function and convinces our customers. evguard® can be laminated both in vacuum and autoclave (pre-lam nip roll), where PVB is processed. In the original packing evguard® remains protected from direct sunlight, dust and other incompatible factors.